It was way down my list at 57, fondant. For very obvious reasons. Hard to make. For professionals only. Beautiful to look at (impossible for some home cooks…and on and on and on). But in the dead of that Friday night, I imagined I was Buddy, The ‘Cake Boss’, working in a small kitchen in Hoboken, New Jersey. 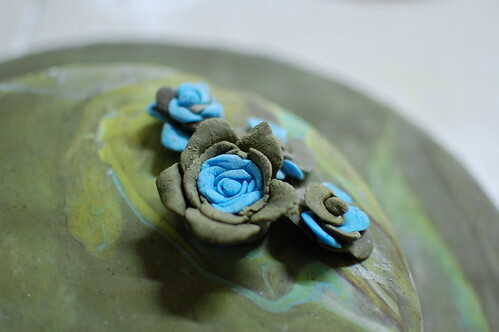 Creating wonders of fondant to amaze men and women. I am always amazed at how I make bakethroughs (and breakthroughs) in my life. One suggestion, a challenge, timing and suddenly, confidence arrives and fear of failure disappears. 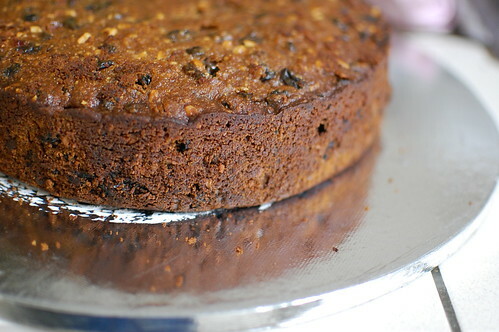 Sometimes I resist with all the might I’ve got – I refuse, run scared but when my mum suggested I bake a cake for my brother-in-law’s Fortieth birthday, I said ‘Yes’. But mentioned I would only be able to ‘rough-ice’ it to which she said ‘No. I’d like ‘proper icing’. To which I responded, ‘I don’t know how to make Royal icing or fondant’. It was as though she didn’t hear me. She just went on and later said ‘So the cake will be ready when I come back’ (we live in different cities). And I said ‘I can’t commit, I haven’t agreed to anything’! But it triggered something. A desire to finally conquer rolled fondant. Sugarpaste. 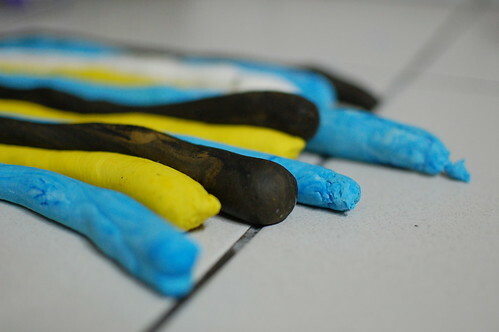 Gumpaste. I sent a text message to a friend of mine saying ‘Help, I need to make fondant’, and she replied almost immediately with the list of ingredients. Then I called her for the ‘method’. The wonders of technology, right? No more cookbooks in the kitchen, only phones and the like :-). There were so many great discoveries along the way – the short ingredient list but also the fact that in my city, there are so many gorgeous cake shops – a fact that I was completely oblivious to! Tip #2 – Sprinkle the granules of gelatin over the surface cold water or liquid. Use 1/4 cup, 60ml, or whatever quantity is called for in the recipe, per envelope. 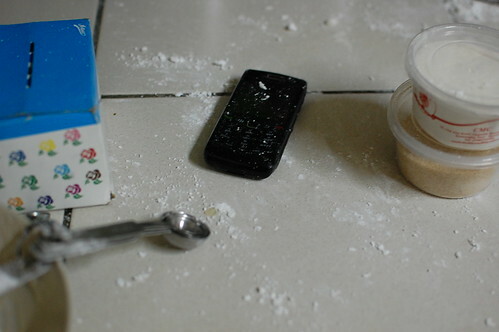 Do not dump them in a pile, as the granules in the middle won’t dissolve. Let stand for 5 to 10 minutes. 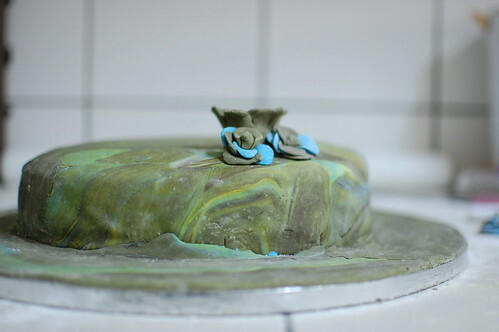 I made the cake in advance, and let it ‘bloom’ a bit and then the night before set out to make the fondant. Phone on counter. The instructions were easy. Too easy in fact. Let the gelatin powder bloom in water then make a liquid syrup of liquid glucose, gelatin mixture and stir that into bags of icing sugar and some CMC powder. Then form a ‘dough’ and colour as needed! From The Sugar Lane: CMC Powder or sometimes referred to as Super Gum and CMC Gum, and the technical name Sodium Carboxymethyl Cellulose Gum, or just Cellulose Gum is frequently used as a thickener and a texture ingredient in many applications throughout the food service industry. Food grade and industrial grade CMC Gum is also known as cellulose gum. It is derived from purified cellulose such as cotton linters. CMC Gum helps products retain moisture. CMC Gum is a man-made gum. CMC produces the highest cohesiveness (such as sticking together). CMC is frequently used as a thickener and a texture ingredient in many applications used in the food service industry. 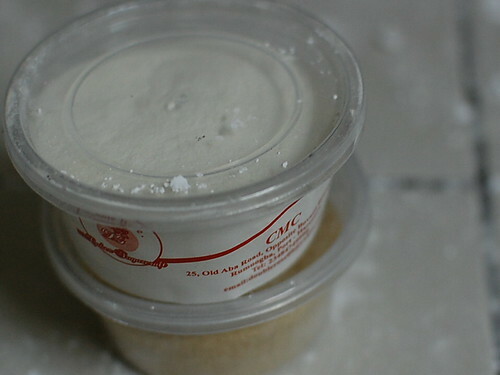 Also CMC gum helps products retain moisture. In a microwaveable bowl, or another that can withstand heat, sprinkle gelatin over cold water and let stand for a 5 – 10 minutes till it becomes thick. Then combine gelatin with liquid glucose and microwave or heat up in a bain marie, till the mixture becomes liquid, about 1.5 – 2 minutes in the microwave at 600 watts. Allow to cool till it is lukewarm, 5 about minutes. 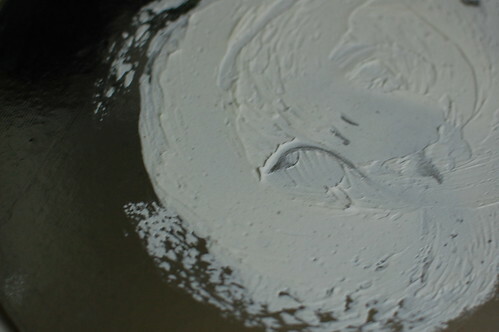 Put the icing sugar in a large bowl, and add the CMC powder, stirring/whisking together to combine. Then make a well in the centre. To the well, add the liquid glucose-gelatin mixture. Stir with a wooden spoon, from the centre out, pulling in the icing sugar bit by bit to incorporate till it starts to come together and the stickiness disappears. Knead in remaining sugar and continue kneading until the fondant is smooth, pliable and does not stick to your hands. Tip #3 If fondant is too soft, add more sugar; if too stiff, add water (a drop at a time). On my friend’s advice, I stored my fondant in a ziploc bag overnight. However, some recipes suggest it can be used immediately. Tip#4 Do not freeze (don’t ask me why) – if not using it immediately, store it in an airtight container at room temperature until needed. If storing longer than 1 week, refrigerate. 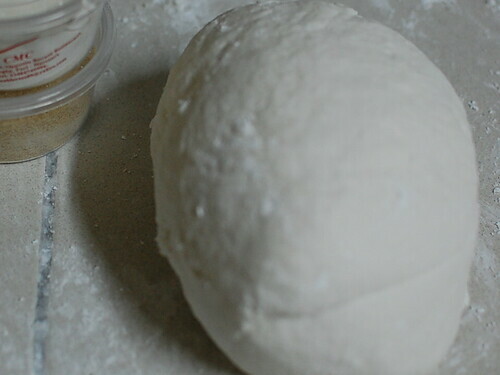 Bring to room temperature before kneading and then knead again until soft. It didn’t look so bad…. 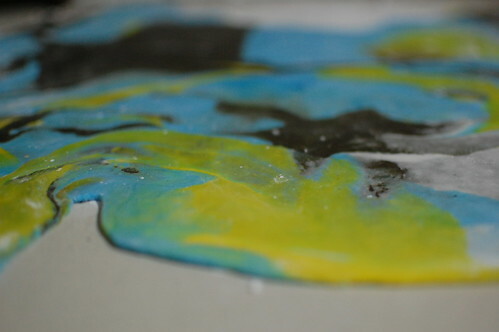 All this while, my fondant was ready and I decided I was going to make a ‘marbled’ cake. Tip #6 If fondant becomes dry, either by adding too much sugar or air drying, add a small amount of solid vegetable shortening (like Crisco) and knead thoroughly. I rolled my fondant into strips, twisted them together and was about to roll it out when my 4-year old strolled into the kitchen. 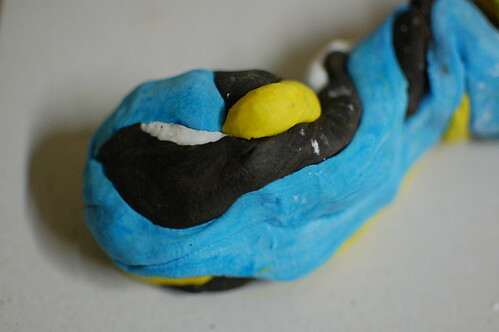 I’m sure it resembled playdough and I could not say no to his offer of help. So we rolled it out. 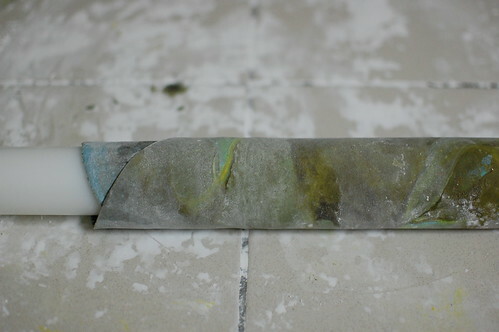 ….changed to this – which you can’t see but take my word for it, blue and yellow changed to green…. So then I changed my ‘speech’ about the ‘reason for the cake design’. When I presented this to the brother in law who loves all things military and war, I was going to present it as a ‘Camouflage cake’! And I did! Everything must have a story, mustn’t it? 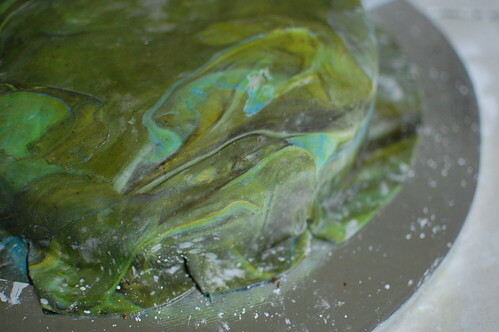 Tip #7 Colours in fondant act as liquids so the more you mix, the more the changes in the palette. 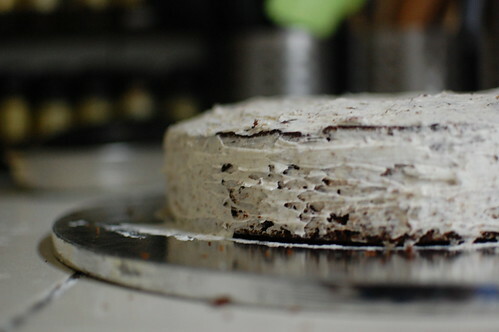 Trim the excess fondant off the base of the cake. I should have covered the cake board with a bit of fondant first, as my friend advised but I was so scared I would run out that I didn’t. And the signs are obvious. 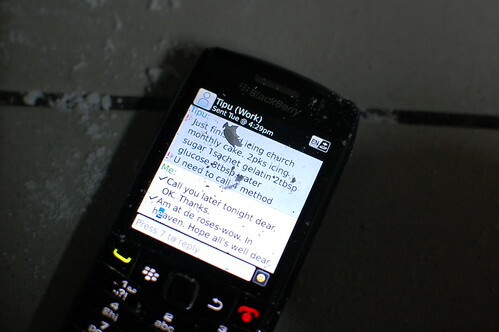 See the patched base? 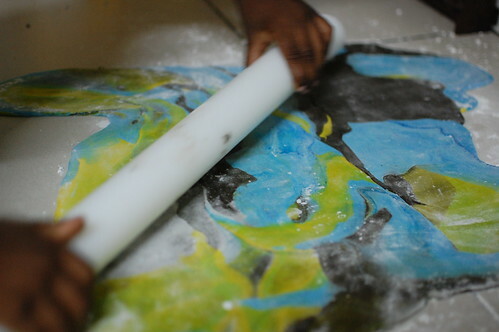 Tip#8 You can use the ‘pie-dough on rolling pin trick’ for fondant too. So when you finish rolling out your fondant and cutting it to the desired shape, gently roll it on to the pin, lift and then position over the cake. starting to release the fondant from one end to the other. Anyhow, by this time the daughters were awake and keen to do something for their uncle….. so we got to making some roses which same friend had taught us to make with play dough last year! 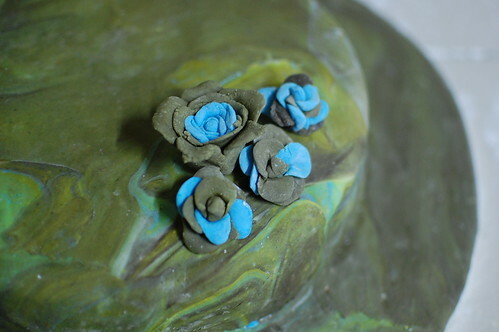 In the end, I decorated with 4 buds, each representing 10 years. See, 40 is a special number! Like sticks of butter! The cake was wrapped in transparent ‘foil’ and presented. My mum loved it, my brother-in-law appreciated the story and the party was great and I? Well….I knew I had arrived. Know again that I am able to do ALL things (that I need to do), that there is sufficient grace…and courage if I believe. That fear can’t hold be down…or back! And that, another item on that list bites the dust! Yipee ya yay! Next stop might just be that gingerbread house, any tips? And are you a fondant lover?